Today’s aura bath will be intended to help you clear your energy of any low vibrations. 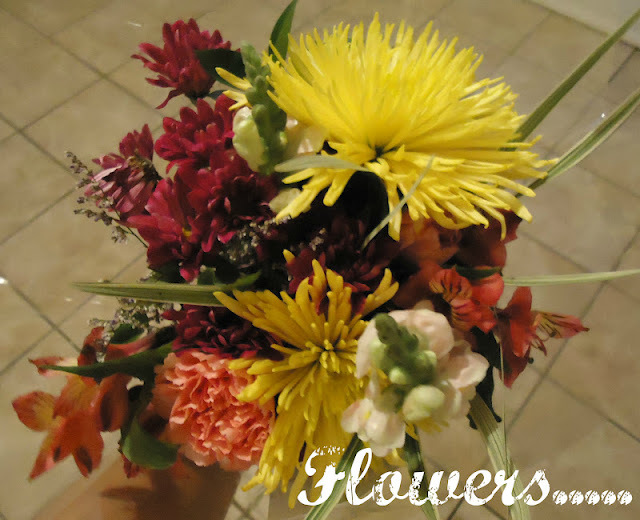 As always you can use any type of flowers you’d like. I picked these up at my local supermarket for $8. The ingredients also can vary depending on your intent. 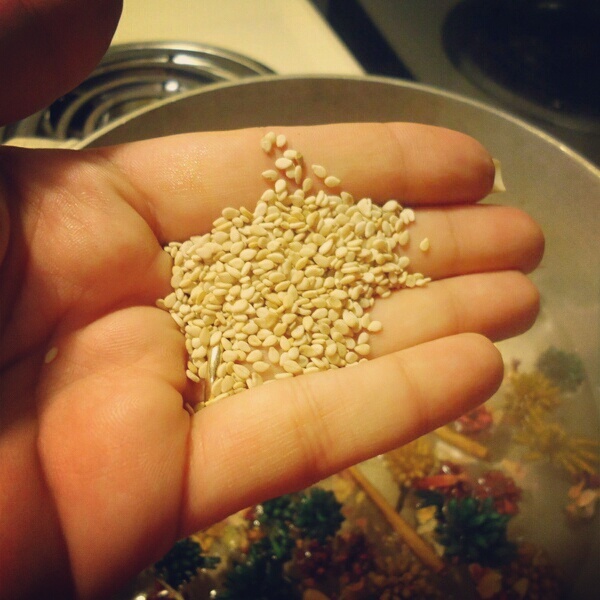 Sesame seeds are my favorite and often time use it in honor of Ganesha and most importantly to keep the door to prosperity open. Plus when I look at them I can’t help but think “Open sesame”, weird I know. Sesame seeds are mostly used to attract money and prosperity. Avocado oil has been frequenting most of my magical recipes especially for love and calming purposes. Promotes happiness, love and prosperity. Ylang Ylang is my long time favorite oil and a little goes a long way. 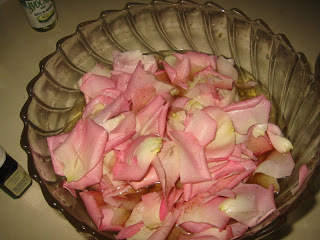 It’s scent is so refreshing and usually reminds me of new beginnings. 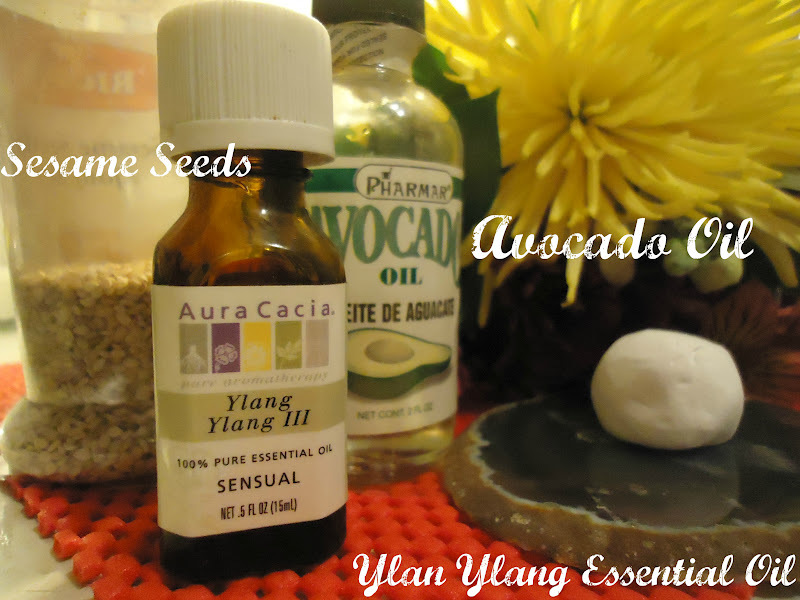 I added 3 drops for scent and to enhance the avocado oil’s love properties. One interesting ingredient I decided to incorporate is cascarilla. It’s basically dried up egg shells used primarily to represent new beginnings, promote peace, purify and protect the aura from negative vibrations. 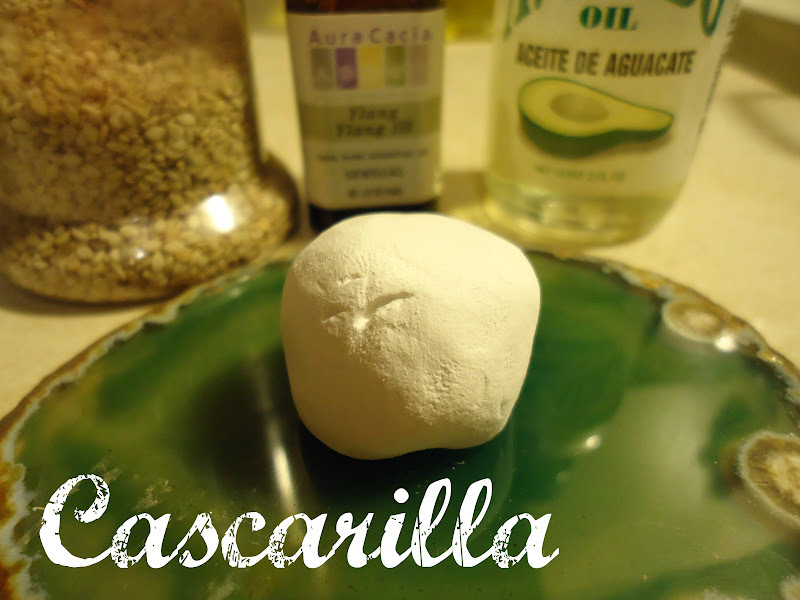 There’s a wide variety of uses for cascarilla. You can use it to draw symbols, dust off your aura, sprinkle around your areas for peace and tranquility. I’ve been meaning to make my own cascarilla, hopefully I get it off my to do list and have a tutorial up soon. 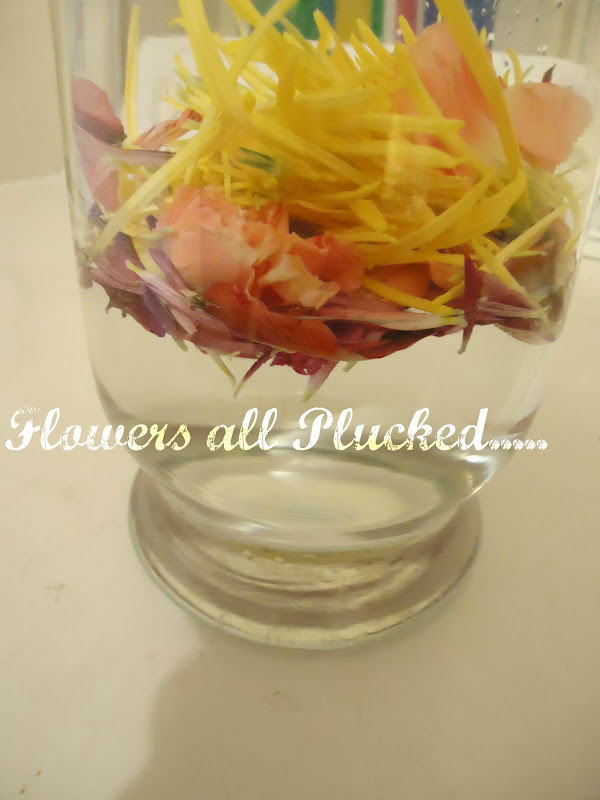 Once I finished plucking all of my flowers ( I plucked about 4 stems for this bath, the rest I put on my desk), I added all the above mentioned to my water. I take my normal shower as usual and then pour the bath over me as a final rinse. When making your bath be sure to keep your intent specific to your needs to ensure you program it with your intent. Work, career etc is a very essential component to an individual’s social existence and overall form of sustenance. With the recent lagging economy, finding a job and keeping one has proven to be a burden for many. Lucky are those who are set in their careers either by choice or luck and even luckier are those who have a job period. I’m sure many of you have experienced being laid off first hand or heard of one department or the other downsizing or shutting down completely. It brings morale down and leaves the remaining employees on edge constanty worrying if they’ll be next. During times like these many are left discouraged. But I say it’s a great time to add a little effort into your career and liven up the door to success. If you are looking for a job, want to establish yourself in your current career and progress up the ladder, this career charm can help you. 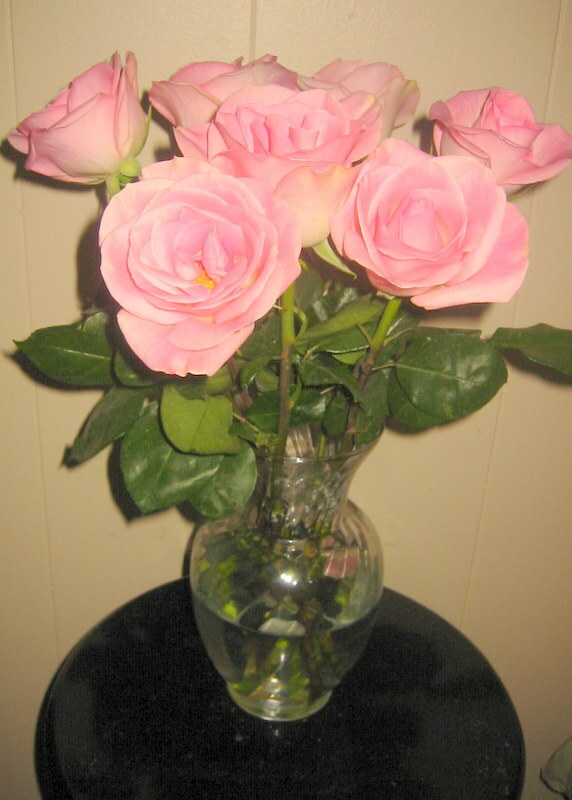 It can be placed in your desk, filing cabinet or even purse to help encourage the vibration. Red is associated with the root chakra which represents stability and survival in the physical world. Making sure you have enough food, shelter and so forth is what rules this chakra. Red in this amulet represents stability, order and sense of being grounded. 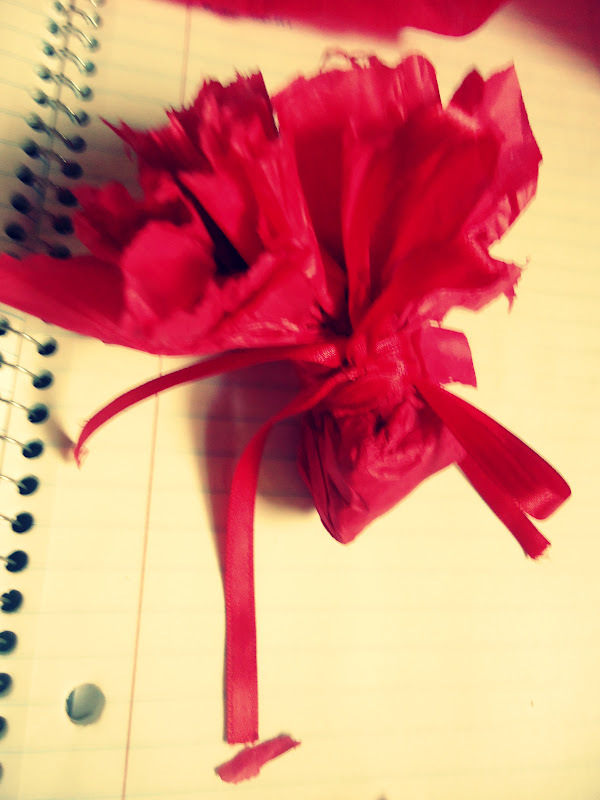 On this red paper you will write what you hope to achieve. Often time I write what I’m going to visualize and meditate on, following this recipe. You can write anything you’d like. Whatever resonates with you is fine. 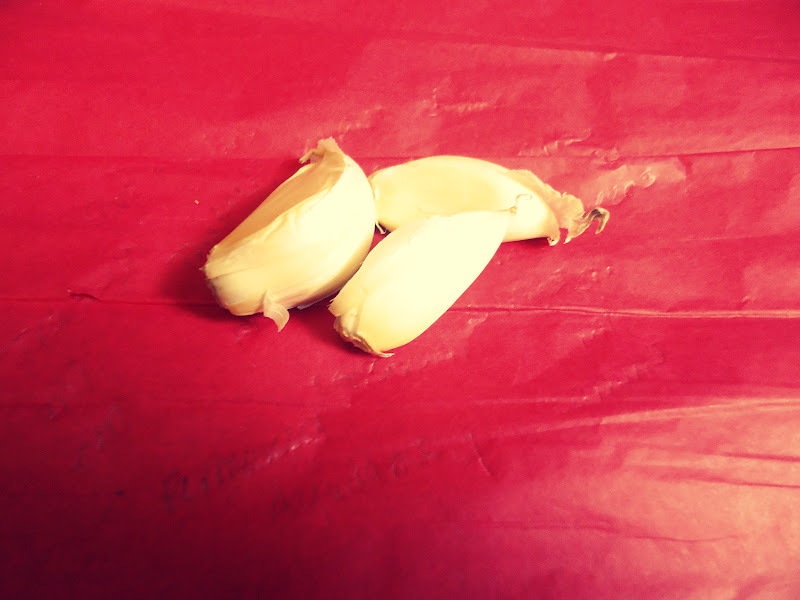 Garlic is known to ward off negative vibrations. Whether it be your own negative thinking, lack of confidence, confusion these type of low vibrations do not let you see the clearer pciture and in turn your self confidence takes a beating. Often times it can be the debbie downer/ hater of the office constantly creating an atmosphere of negativity. Whatever the case you must not allow yourself to feed into the negativity. Focus your intent and blur out the insignificant. 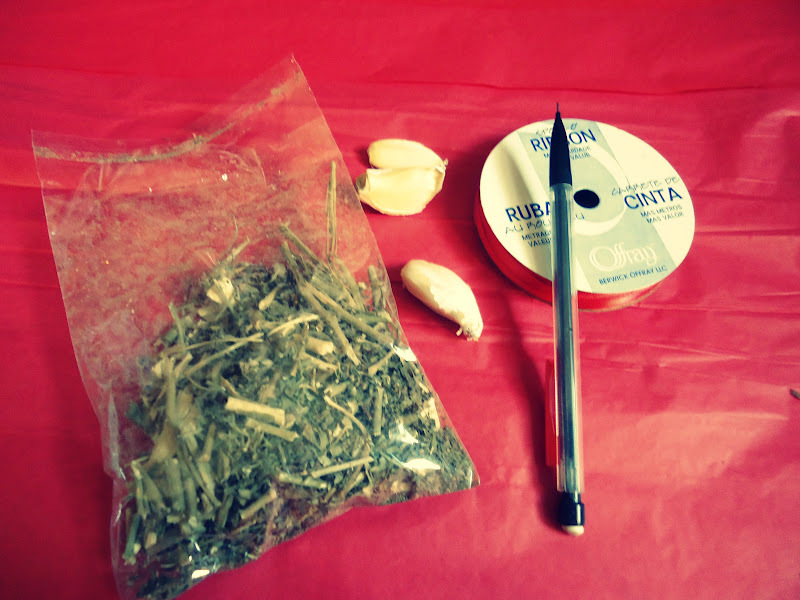 Ruda is my favorite herb to use in everything and I’m sure I’ve mentioned that many times before. Ruda purifies and attracts luck. It’s also used in matters of work, money, and prosperity. To read more about Ruda, check out my post here. 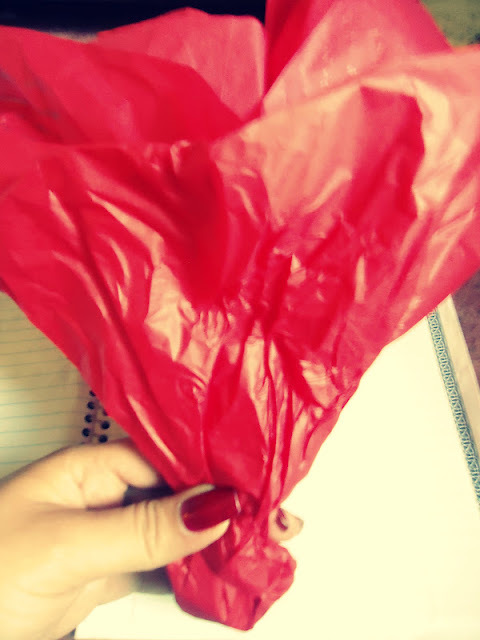 Once you’ve gotten your ingredients all together, you want to take your red gift bag paper and wrap it all up. 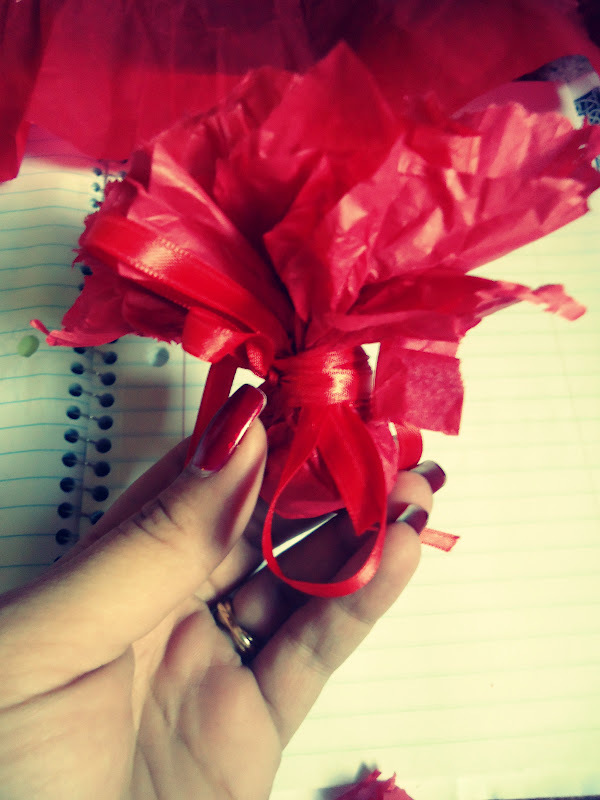 Then you want to wrap the little bundle with the red ribbon. Any excess paper can be trimmed down. You can also use fabric if you’d like instead. I used gift wrapping paper because it’s easier to write down my affirmation. Charms and amulets as such are used to help you center your energy. Often time our energies are scattered and too much is going on. By focusing on one thing at a time can help you center your energy and focus on one aspect of your self at a time. I’m going to start working on more charms, amulets and such. I’ve been reading a lot about ancestor veneration and will be focusing on that for these next coming months. So stay tuned for that experience. 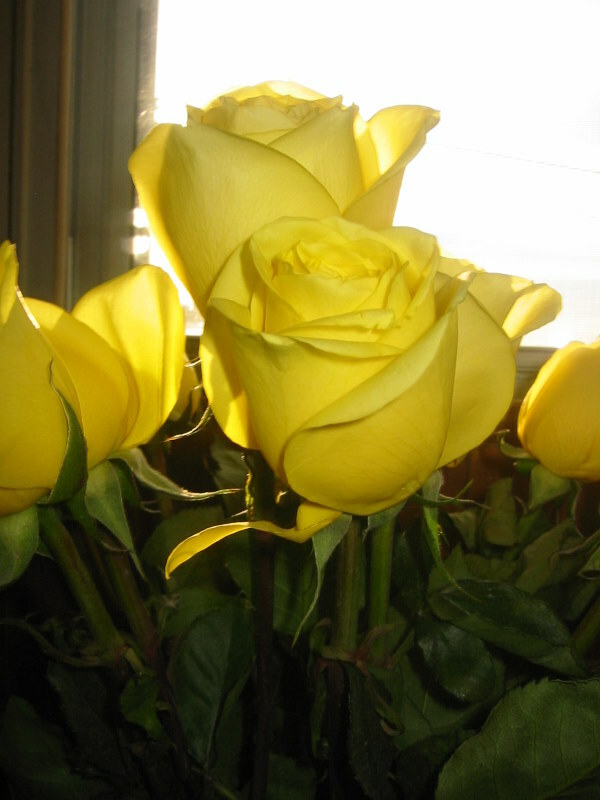 One of the main things I always strive to maintain within myself and my home is joy and prosperity. To keep that easy going, bright vibe flowing in my humble abode, I glamed up my Lucky Budai to encourage the joyous mood. Many interchangeably associate Buddha with this laughing Buddha or rather Budai. Although closely related they are actually very different. I use Buddha’s energy mostly for my meditation sessions and smuding as shown here. When meditating with Buddha I focus on maintaining true inner balance, discipline and peace. Budai on the other hand to me represents, joy, wisdom and prosperity. It helps me shake off that strict all work no play moods which stifles imagination when not properly balanced. I usually get into Budai’s energy which reminds me to let go and be content for all that I have. This mini Budai is usually sitting by my main door. When I get home from a stressful day’s work Budai is greeting me with a bright smile no matter what kind of day I’ve had. Every once in a while I tend to bring all the day’s stress home, so keeping budai at the door to greet me reminds me to smile, relax and put the day behind me. Every now and then I offer Budai rice, sesame seeds to give thanks for the daily foods I’m fortunate enough to indulge in, Bay leaves to keep negative vibrations and thoughts away and pennies to promote work and abundance. Don’t be afriad to rub Budai’s belly every now and then! Makes me laugh all the time. As mentioned in Part one, by now you should already have your intent set and ready to start balancing your Aura. Now all you will need is several ingredients and those thoughts you’ve set in motion. Your garden, local supermarket, cupboard and basically anything from anywhere that will inspire and work with your intent can instantly become your ingredient. 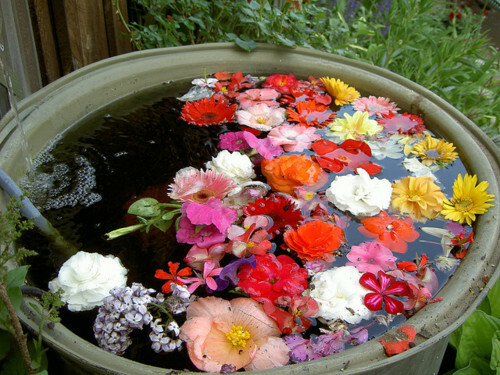 The possibilities are endless when it comes to concocting your aura bath. As you will see some ingredients come from the same stuff I use to cook at on a regular basis. Others you can find at many new age stores as they call them, festivals etc or at botanicas known throughut NYC’s afro caribbean neighborhoods. Considering for whom I was catering this bath for, unlocking a door seemed appropriate for this person. So this bath is definetly for the type of person who is afraid to even turn the knob to see if it’s locked in the first place! Before I opened this bag I was expecting the usual dried herbs I usually find in these pouches. But to my surprise I found a bunch of colorful pine cone like flowerettes. When I opened the bag I gasped and went “ohh”. Only because I was really surprised, they were so cute! It was a rather pleasant surprise and I had very good feelings because I knew this bath was off to a good start. 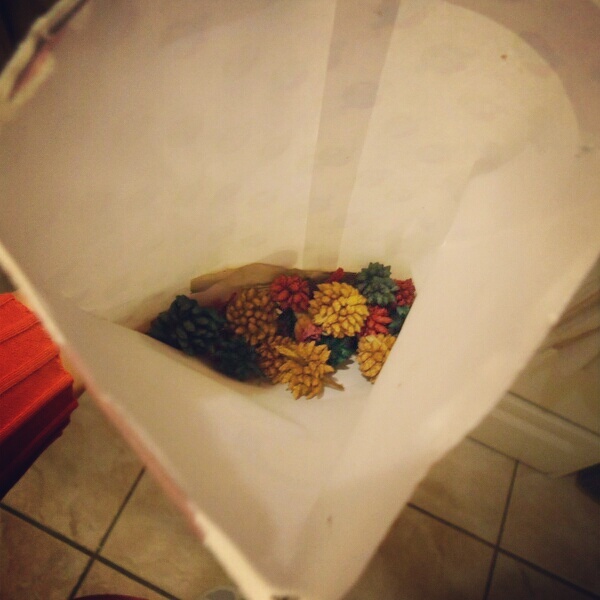 The first thoughts that came to my mind when I saw these colorful pine cones were the Pineal Gland and the Chakras. Chakras for the colors and Pineal gland (aka Third Eye) for the association that organ in our brain has with pine cones. Pines cones are said to be used as symbols for the pineal gland which is closely related to dreams, psychic abilities and so on. When making Aura baths the type of water you use depends on you. You can use tap water or buy distilled water. In this case I used distilled water. No matter what type of water I choose I always take a moment to “charge” my water. I may simply say a few things associated with what I’m trying to accomplish (for example: This bath is to strengthen my aura, I take a moment to charge this water to help strengthen my aura against negativity, sickness etc) or I meditate on it for a while envisioning what I hope the bath to accomplish. It all depends on you and the energy you put forth. 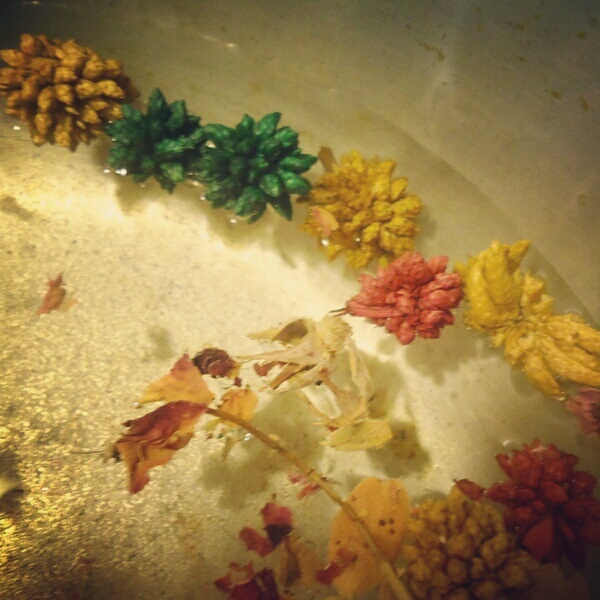 These pines cones were a very delightful surprise….. their association with the third eye turned out to be very interesting because that’s just what I hoped for this bath to achieve. To open the mind, the third eye into a greater understanding of not only our surroundings but most importantly ourselves. 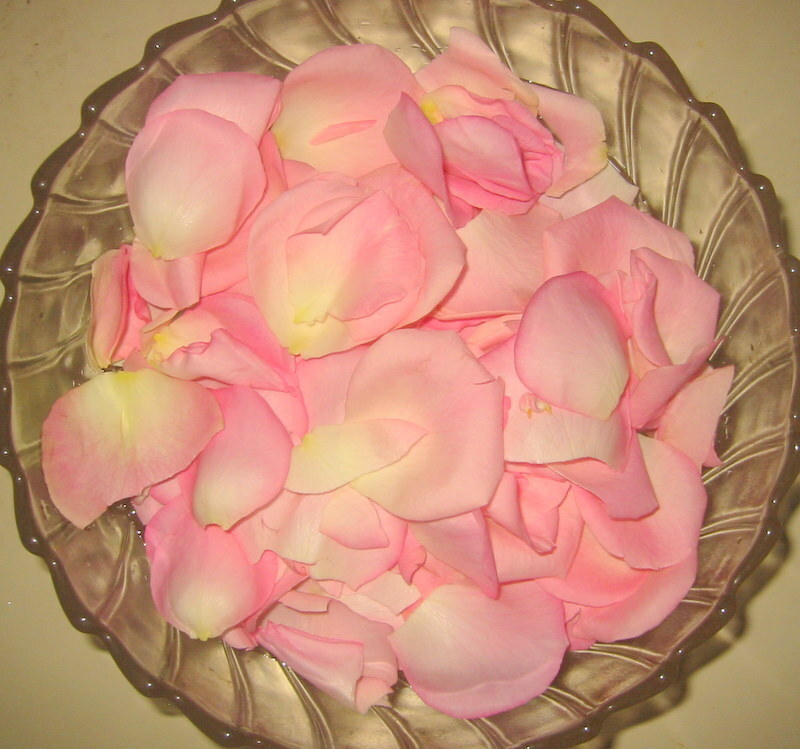 The ingredient for any aura bath really depends on what you wish to attract. In this case we are looking to attract prosperity, opening of the mind to greater understanding of one self and dispelling negative vibrations and thoughts. 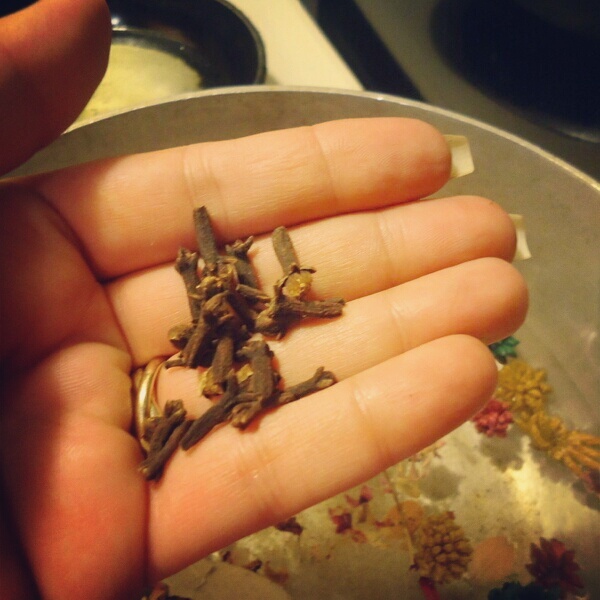 Cloves are very useful for any type of bath. 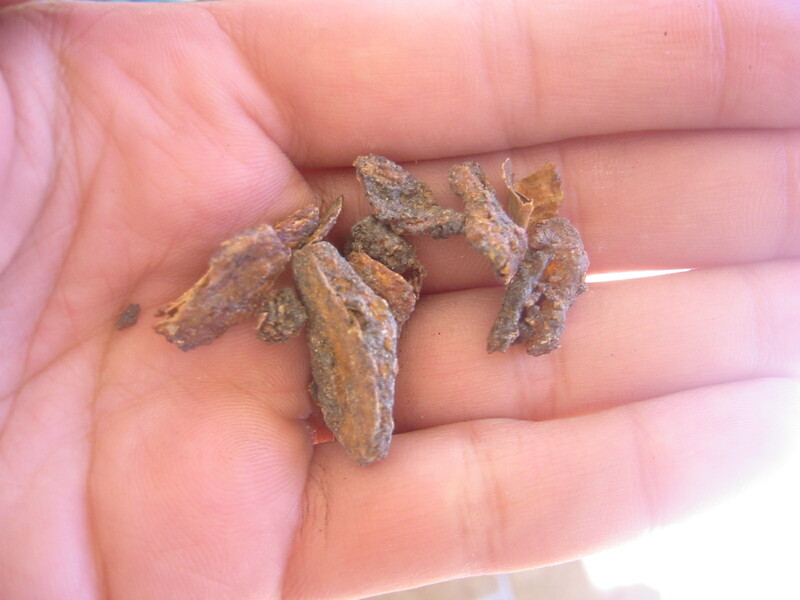 Cloves are used in spiritual magic to drive away negative energy. 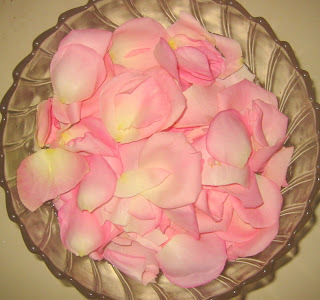 It also purifies the aura when used in a bath as well as attracts prosperous energy to help enhance your manifestations. Sesame seeds were added to this bath to help unlock the door to greater paths. You can also read more on sesame seeds mentioned in a post here. Sesame is said to help unlock doors in the personal sense of overcoming obstacles in one’s life. Cinnamon is one of my favorite magical ingredients and often use them in most of my personal baths. 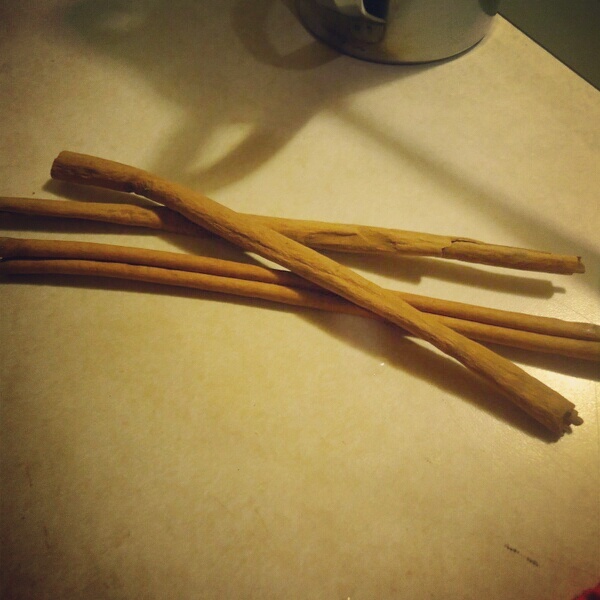 Cinnamon is often time used to enhance spirituality. So if your on that curious path of knowing the greater purpose of it all cinnamon can be a great mind opener. 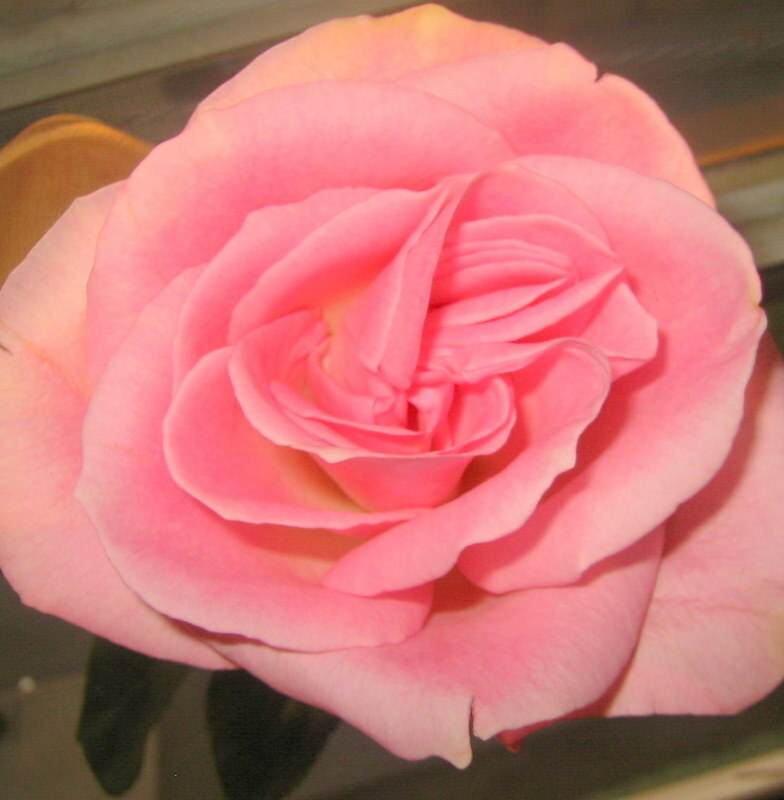 Can be used for success, healing, power and for spiritual meditations as well. Although not pictured, I also added a few bay leaves for an extra added touch. 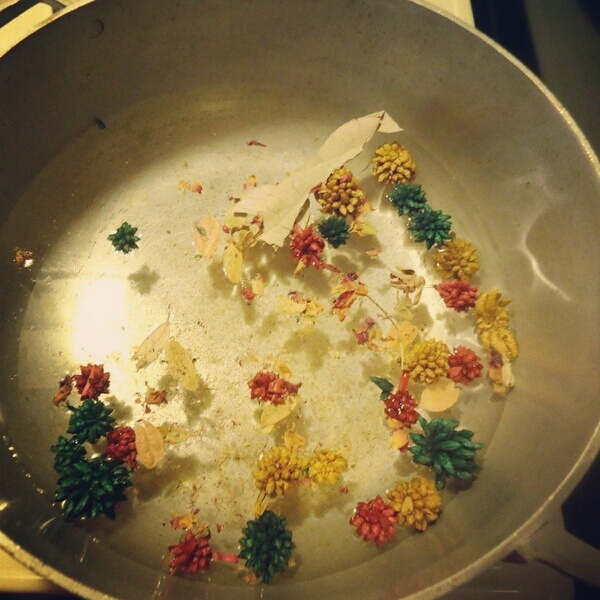 I let this simmer slowly for about an hour. Then I top it off and let it sit until cool. Once everything is done I use glass bottles and seal them with labels. It’s a very interesting process and while doing an aura bath especially for others, you want to be mindful of your thoughts and feelings. I always plan ahead and choose quiet mornings to get my baths started. With a clear mind and focused intent anything can be done. 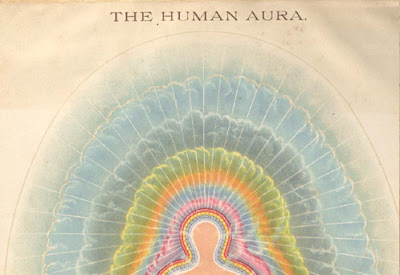 As mentioned you want to have fully visualized what you want the aura bath to accomplish. It’s always best to start simple. I always ask for peace, balance, wisdom and inner tranquility. With those self developed qualities I know I can achieve anything. Once you have taken your mundane bath and rid yourself of the physical grime and dirt you want to give yourself a final rinse with your bath. I usually get two baths from a bottle like this. I have a separate cup in which I add warm bath water to help with the cold weather. Since summer is right around the corner that won’t be necessary. If possible you can let your self air dry otherwise lightly patting yourself dry will also suffice. So let me know how it goes. Remember you can always add a little extra or take away. Recently I’ve been working on a few aura recipes for myself and some family and friends as well. The common request I’ve encountered lately has been opportunity. Many have felt they haven’t had the opportunity to accomplish some of their desires. Be it their jobs, personal lives many seem to be stuck in what they’re either doing or trying to do. Have you ever felt like you’re constantly trying and nothing seems to manifest? A whole host of reasons could be contributing to your lack of opportunity. One of the greatest is fear. Fear can keep you paralyzed and living in a stagnant state of being. Self doubt and lack of self confidence can leave you drowning in routine after routine always settling for less. Or there maybe unsupporting people in your life who don’t seem to give you that boost in confidence. Instead you’re riddled with criticism due to envy or their own fears. Whatever the case may be you need to identify your weakest points and strengthen them with intent to overcome obstacles that may be closing door after door of opportunity. In addition to fear your thoughts also plays a major part in attracting what you want in your life. If you don’t see yourself doing exactly what you want the messages, which are your thoughts, will never make it out into the universe. If your thoughts are constantly negative you will attract negative people and situations. Protecting, enhancing or cultivating your aura can be a great way for you to become in tune with your self in accordance to your surroundings. 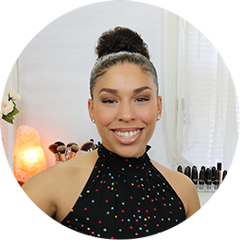 In part two of this post I’ll show you in more detail how to make your aura bath, where you can get your ingredients from and what you can also add to personalize for your own needs. In the mean time take some time to think on what exactly you will accomplish with this bath, so once your’re ready to make your bath you will know exactly what intent will manifest because you’ve already set your intent in motion. 2011 is soon coming to an end. Usually this is the time of year when we tend to set out goals for ourselves whether be it diet, exercise, personal or work this season typically exudes a feeling for change and renewal for a lot of people. Throughout the years I’ve come to know of many rather unique New Years Eve rituals such as 12 grapes at midnight, running around the block like a mad woman with luggage to travel, yellow underwear to attract luck and the list goes on. 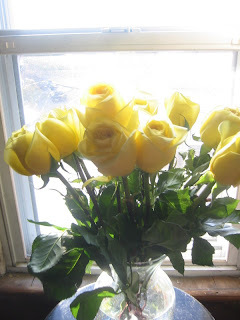 In this post I will show you a much more intimate and unique way to bring in the new year with peace and prosperity without all the hassle. First you will need intent. Visualize in your mind what you will be doing in 2012. Not what you may be doing but what you WILL be doing. Think it. That is perhaps the most important ingredient to any goal. Believing in yourself and having a clear enough view of what exactly you want your life to be can make a world of difference. Secondly, use the many interesting and versatile elements of nature. There are so many living things in nature that work with our spirits and truly come to life when given the opportunity to be used for it’s naturally intended purposes. Apples represent abundance, health, love and knowledge. 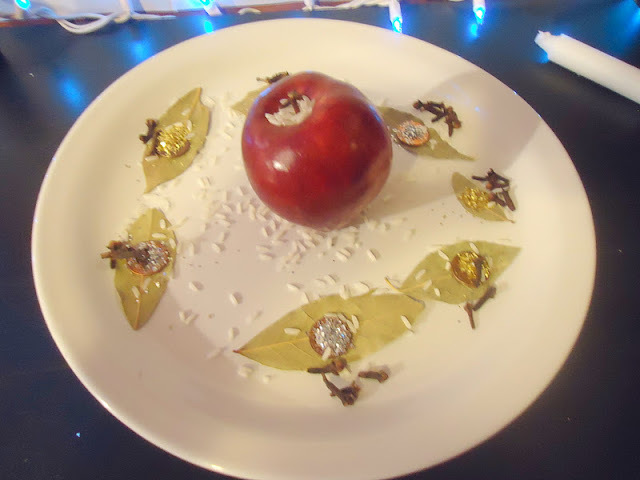 Apples are associated with the goddess Venus and the element water. Apples also represents death and rebirth which is ideal if your goal for the new year is to renew and kick bad habits away. 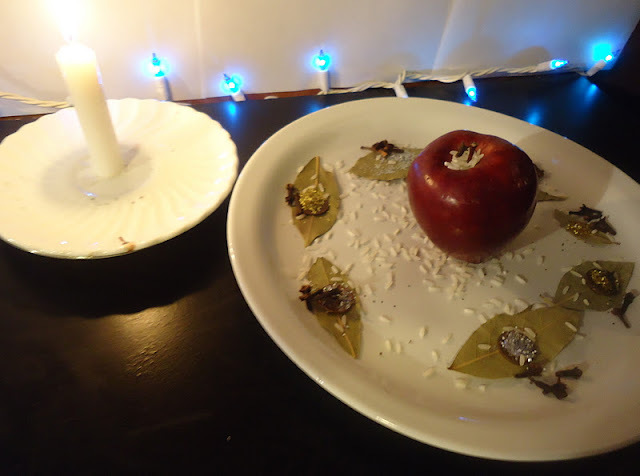 In this offering the apple will represent Love, Happiness and Abundance. 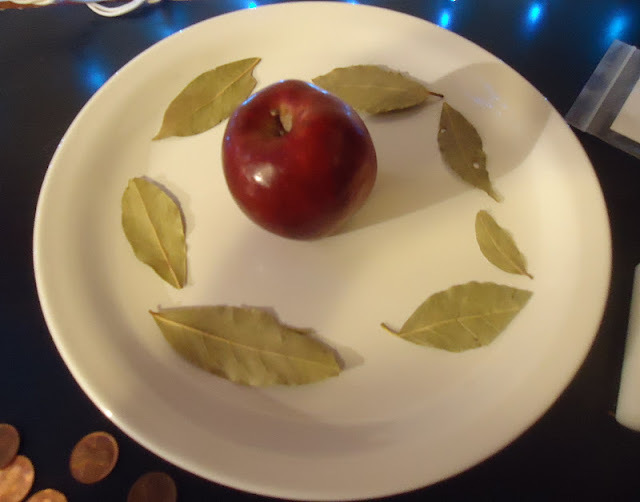 Once you have cleaned your apple put your apple in the middle of the plate and surround it with 7 bay leaves. 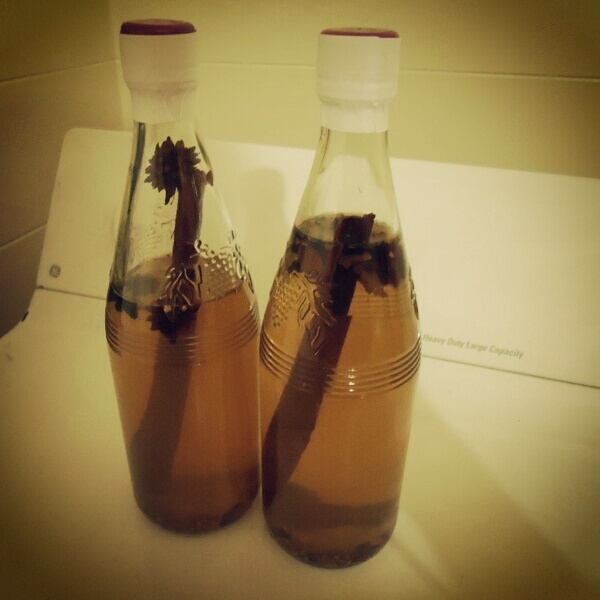 Bay Leaves are used for protection and purifies against negativity and low energy. You can keep a bay leaf in your purse, car etc to help enhance protective energy and keep negative vibrations away. 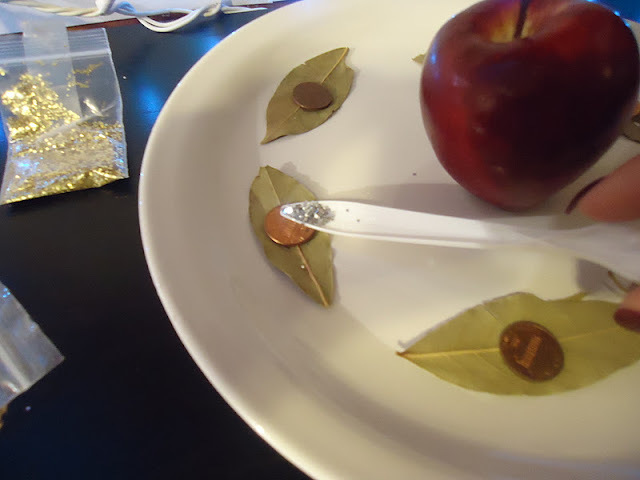 On top of the 7 Bay Leaves, place 7 pennies on top of them. 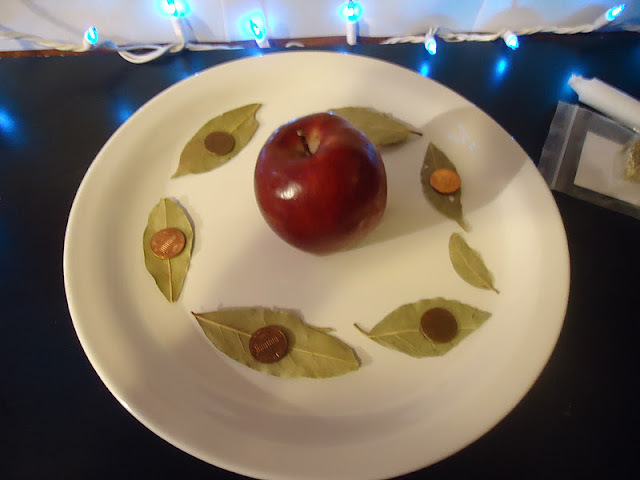 Pennies are also represented by Venus which promotes prosperity and abundance. Pennies are used in this offering to represent abundance with work, imagination and prosperity. Next you will add a light sprinkle of gold and silver glitter onto the pennies, alternating with each coin. Silver is associated with the moon and female intuition. 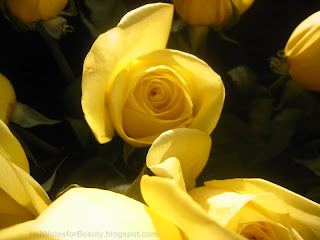 Gold is associated with the sun, representing longevity, abundance and happiness. Being that silver is feminine belonging to the moon and the sun masculine to me it represents balance. The coins are meant to represent copper as well as fortune. The next ingredient is rice. One of rice’s interesting magical uses is to protect from misfortunes and accidents making it another great protective ingredient. Rice is traditionally known to be thrown at wedded couples to increase fertility. To me the rice here represents abundance with food for my family and self. 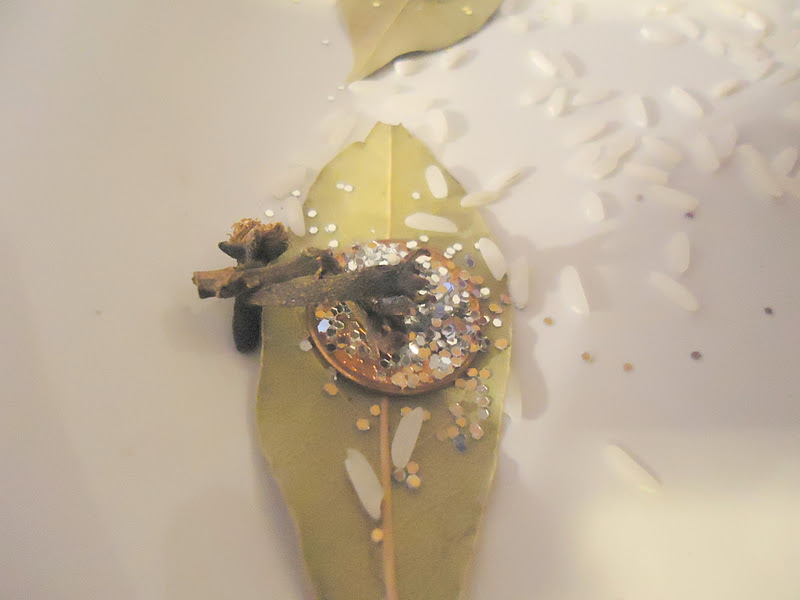 And to add your finishing touch you can add a few cloves onto each coin. 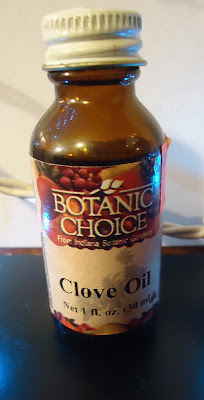 Clove oil is optional, but if you can get it, it would be a great addition. Clove attracts money and abundance. And it’s also protective and promotes love as well. I used clove oil to lightly “dress” my candle with the oil. 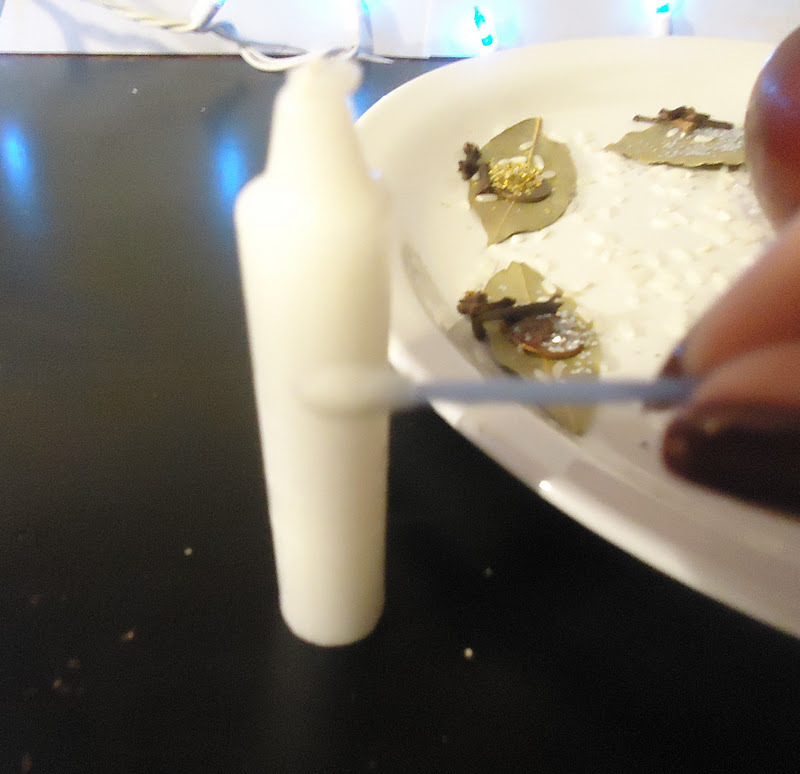 Which is lightly oiling the candle with a q-tip. This step is optional but it can certainly help enhance the offering. In a quiet space in my living room I leave my offering to Peace, Love, Prosperity and Abundance and appreciate all of my blessings in this year and the many more to come. I’ve been very busy as of late! But will be updating with more recipes soon. This is the third and final part to my incense burning series in which I will show you the tools I use to burn my loose incense. I pretty much went over the many uses and different types of incense available as well as the different types of herbs and incense I use to burn. 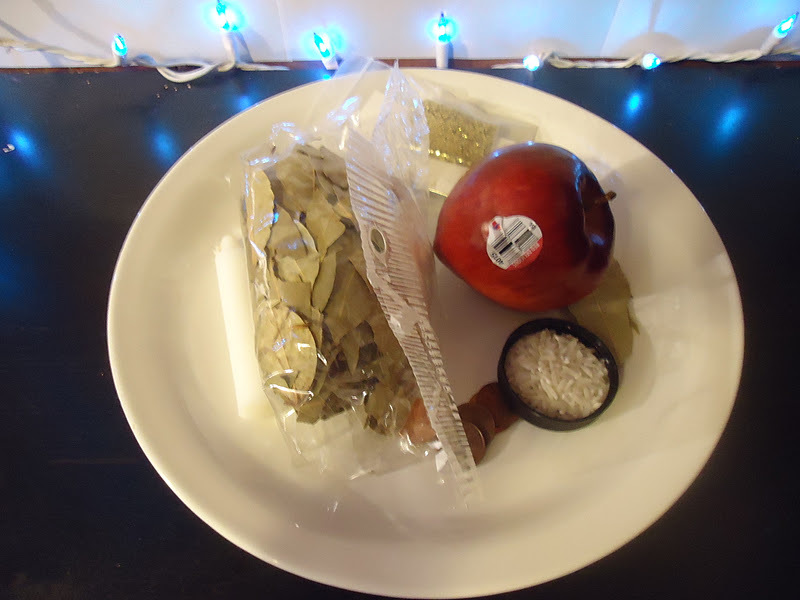 Before getting into burning loose incense there are a few simple tools you will need. There are also some safety precautions you should take before getting started as well. Charcoal- Since I will be burning loose incense I will be using charcoal. These are rather inexpensive and I usually buy them off a street vendor. However there are a few places where you can check online and they average about $3-5 depending on vendor you purchase from. Kitchen tweezers– Once the charcoal is lit you DO NOT want to ever touch the charcoal. Anytime you want to manipulate the charcoal make sure you have your tweezers. I usually light it here then transfer it to my Can. Lighter: This type of lighter comes in very handy. You will need something to light your charcoal up which takes a couple of seconds depending on your charcoal. A regular cigarette lighter may work but I find that it’s not resistant enough because you need consistent heat to ignite the charcoal. I find that this lighter is best. $1 at my local dollar store. It takes several seconds for the charcoal to ignite. Once the charcoal is lit you will see it lightly sprarkle throughout the block. This lighter keeps my hands and nails safe. I prefer to let my cahrcoal sit on the HEAT PROOF censer then light it. Since charcoal is made of potassium nitrate once you hear it sparkle or sizzle you know it’s already lit. Make sure it’s ignited completely by observing the sparkles. Censer: Charcoal can burn up to 1,000 degress or more so it’s important you find a censer for burning incense or a heat resistant container where you will place your charcoal. 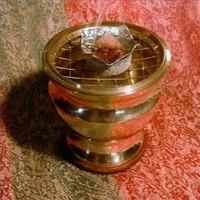 The Censer is what holds the charcoal in place. 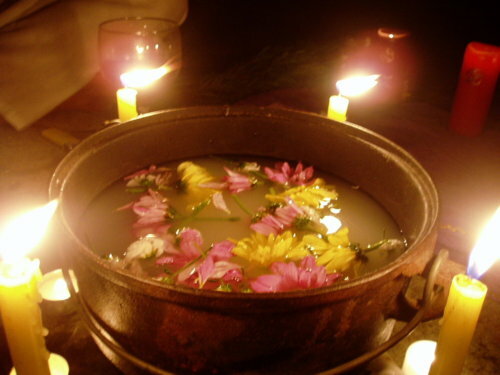 There’s a wide variety of different types of censers, you just have to shop around and see which one works best for you. When I first started, I used a regular can with a plate on the bottom for support. Check this link out to give you a better idea of all the different types of burners available. Since I prefer homemade things before I invest in anything, I went ahead and got an empty can. 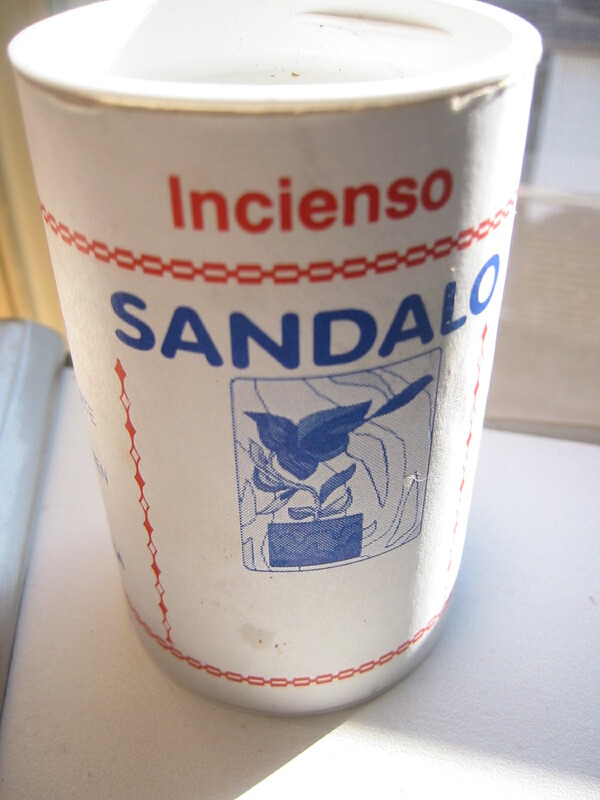 Since the can is not Heat Resistant and can burn to the touch….. I placed two heat-oven, microwave proof coffee plates underneath…..
It’s just a regular old empty bean can I cleaned out. With my kitchen tweezers, I carefully placed the lit charcoal block in the can with the heat resistant plates on the bottom. Once it’s in the can you can sprinkle you loose incense of choice. And you are pretty much ready to spread your incense smoke around. So that’s basically it very simple and effective. Once you start familiarizing yourself with this type of incense you will find that’s it’s very easy and versatile to use. Again this is a great way for you to promote peace in your home as well as purify your space of any negative vibrations. As mentioned in part 1, I recently got back into burning incense particularly for purification purposes, especially around the house. No home is ever perfect and I don’t know of any person who does not ever strive for one. For me home is where the heart is and positivity within one creates a more powerful unit and individual. Your home is where you retreat from all the different kinds of energy you are exposed to on a daily basis and if at the least, it should be the place where you can come to rest and renew your mind, body and spirit. 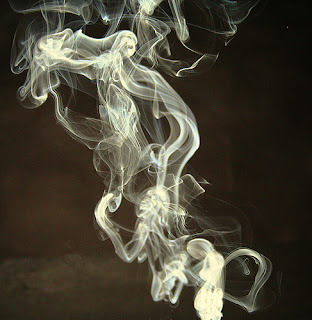 The use of smoke or incense to purify and cleanse people, places and things is a very ancient practice. Throughout many cultures, countries and customs, the belief that energy can take hold of your surroundings (aura, business or home) be it positive or negative, was and still is a very prevalent belief. The lives of our ancient ancestors, for the most part, revolved around keeping this energy balanced. They believed that the imbalance of this energy is reflected through illnesses, depression, anger,confusion and lack of will among many. Some call it prana, chi, mana, spirit or simply energy. Not only are we filled and surrounded with this energy but so are the things, places and people around us. No matter what you may call it, this constant flow of potential life, creativity and renewal known as energy exists in all of us. However you may want to manifest your energy depends solely on you. We are constantly emitting this energy by way of our thoughts and actions toward oneself and others. Unfortunately as individuals it’s difficult to control the negative ways of thinking of most people. That’s why it’s so important to cultivate a stronger and more positive mind for one self, helping to lead by example. What you speak, think and act upon ultimately creates your mood, personality, aura and your daily existence. Your mind, intentions and thoughts are in fact the main components you are trying to put to work here. 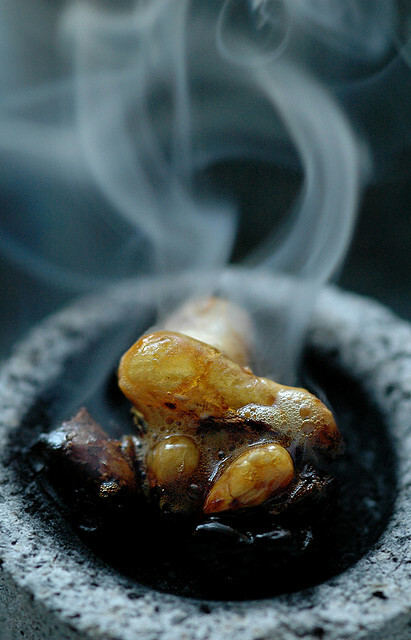 The incense, resins, charcoal and smoke are just mere tools to help you tap into your subconscious mind where your true, deep desires and true self resides. The conscious mind always needs something tangible to hold on to. More like an affirmation if you will. 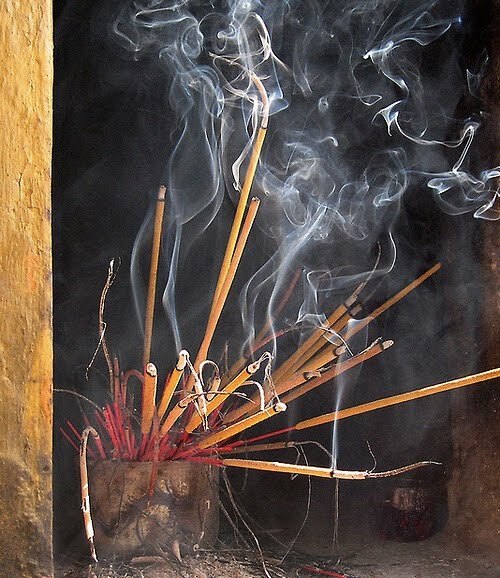 Using incense to rid a place of negative vibrations is similar to smudging and an excellent way to clear your surroundings of negative, unfulfilled energy. 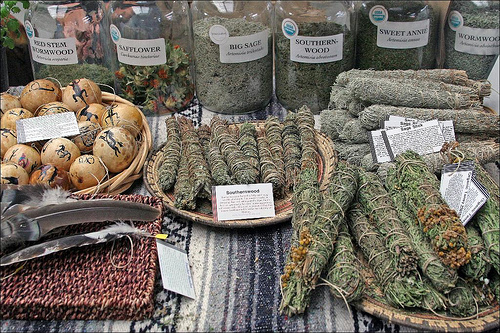 Smudge sticks are basically dried herbs, most commonly sage, bundled, wrapped and ready to burn. 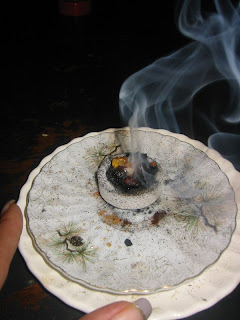 Whether it be a smudge stick or loose incense, the concept of using the smoke to cleanse and purify your home, business or work/personal space is the intention. 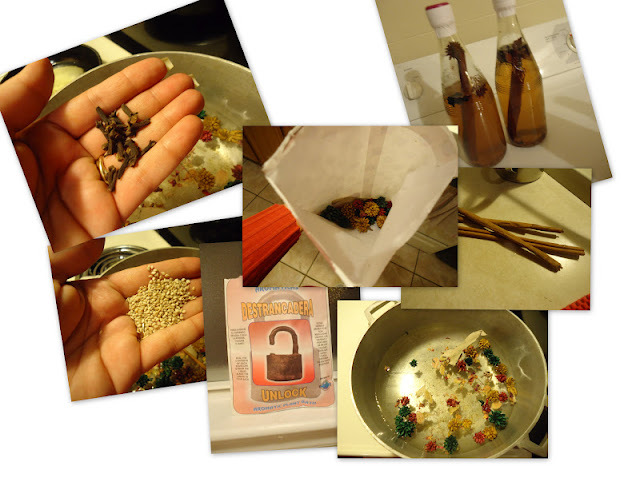 Recently my sister moved into a new apartment and I had the opportunity to mix up a few incense concoctions of my own. I find that whenever moving into a new place it’s always good to give the new place not only a physical cleansing but spiritual one as well. This is a simple yet effective way you can rid the place of the last person’s vibrations and program your new home or space with your vibrations and energy which for me is of peace and prosperity. 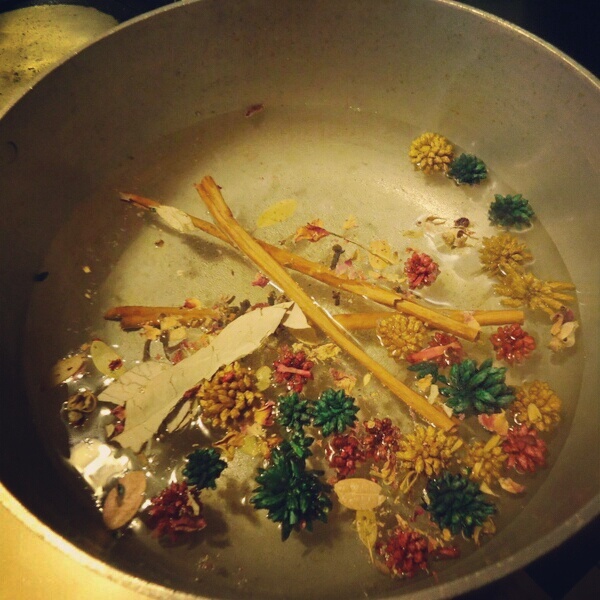 Here I will show you the wide variety of common herbs I have been using to burn as incense. 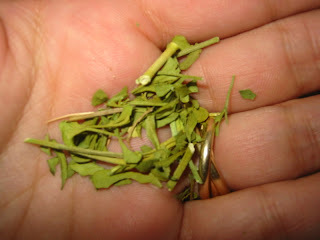 I find that I like to use fresh herbs. Sometimes I grind them or burn them whole it all depends on how I may feel. Like with most things, herbs carry their own energy field and vibrations. Herbs are also very versatile and carry within them pleasing aromas and unique qualities benefiting the body and spirit. What’s so amazing is that you can basically find these herbs at your local food market or kitchen cupboard. Rosemary can be burned to purify any space especially those places where illnesses, conflicts and lack of peace persists. Rosemary helps promote positive energy and it’s known to be one of the oldest incenses. When burned, rosemary helps attract love and lust especially for those seeking love and companionship. Rosemary also promotes healing and mental clarity. 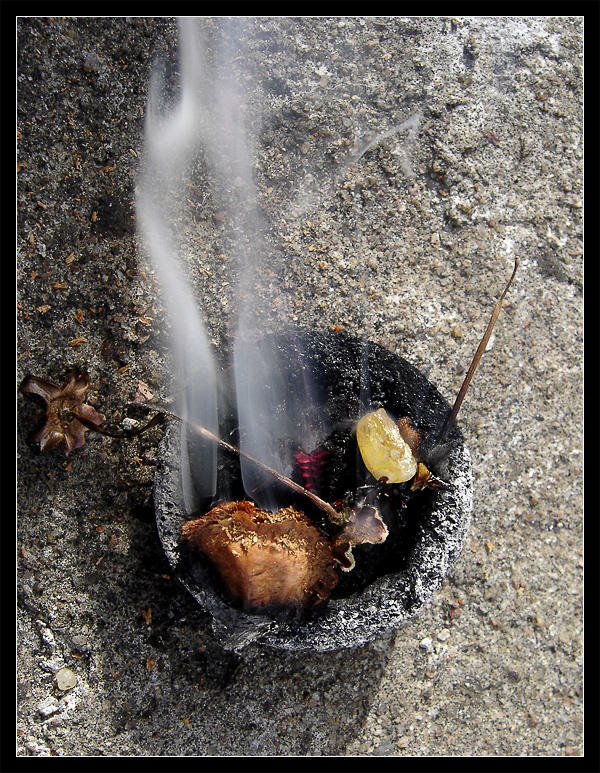 Burn thyme for, healing, purification, courage. Feeling a little fear about something you are passionate about and want to banish those doubtful thoughts and take the plunge? Then burn a little thyme to give you strength and courage to manifest your your intent, be it a new job, change in life etc. Thyme is also burned to attract good health, banishes negative energy and uplifts the mind and spirit. Thyme’s purifying and healing vibrations helps clear an area where someone is suffering from an illness especially long term illnesses. Ideal for creative work spaces, thyme helps to renew energy and purifies spaces of low energy helping you become more productive and creative in what it is you may be working on. Associated with the planet of love Venus, thyme is very useful for attracting all types of love and peace into the home as well. 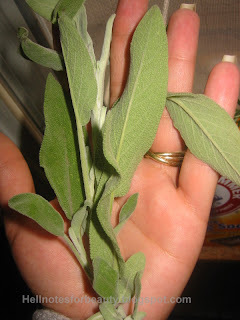 Sage is very popular throughout the Native American tradition and ritual of smudging. 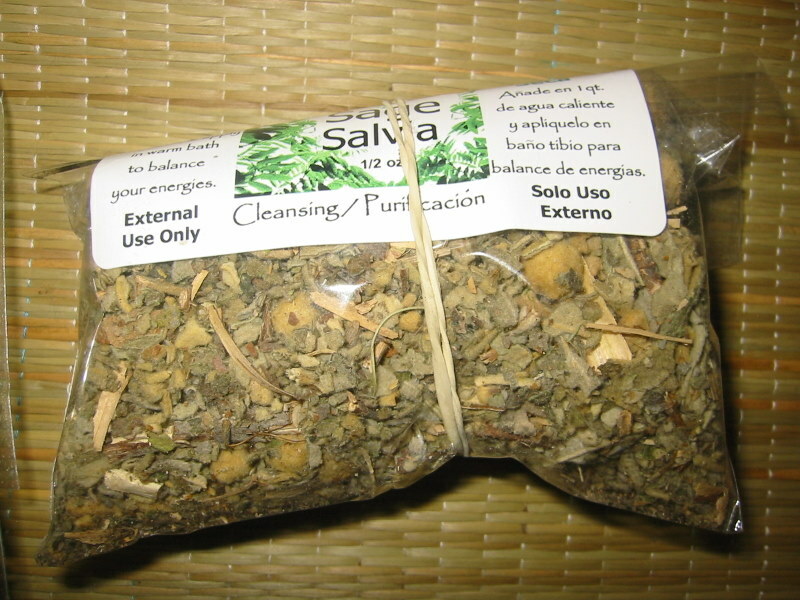 Sage is an excellent herb to have especially for those starting anew. Be it a new home, relationship, or life decision, sage is a very nice herb to burn especially while meditating on such matters. Sage purifies spaces allowing for more life enhancing energy to flourish. Keeping a sage plant near helps absorb negativity. 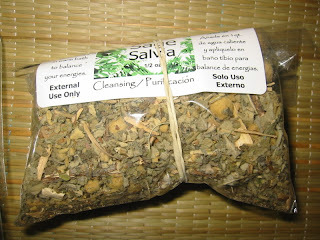 Sage also promotes wisdom and learning which is a very good vibration to promote in any ambiance. This is my first time using ruda. Last year I encountered ruda in candle form and liked it so thought I’d get me a pack just see how well this herb burns. 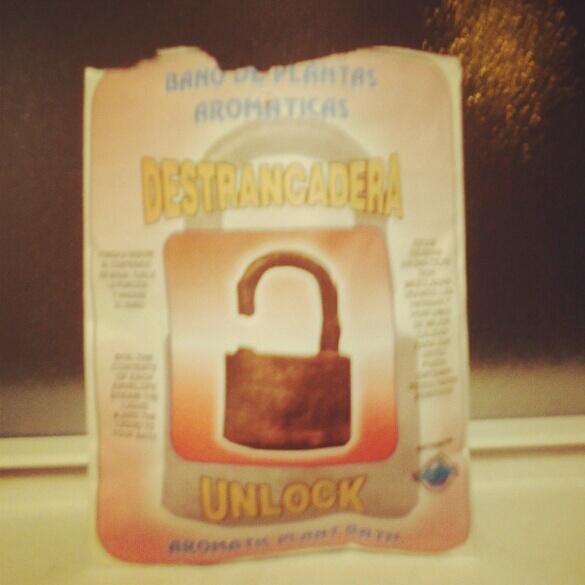 Second to sandalwood, I’m really feeling this herb. When burned, Ruda emits this very soft musky scent that I can’t describe. When I smell it I get this really good vibe and thoughts of comfort always comes to mind. 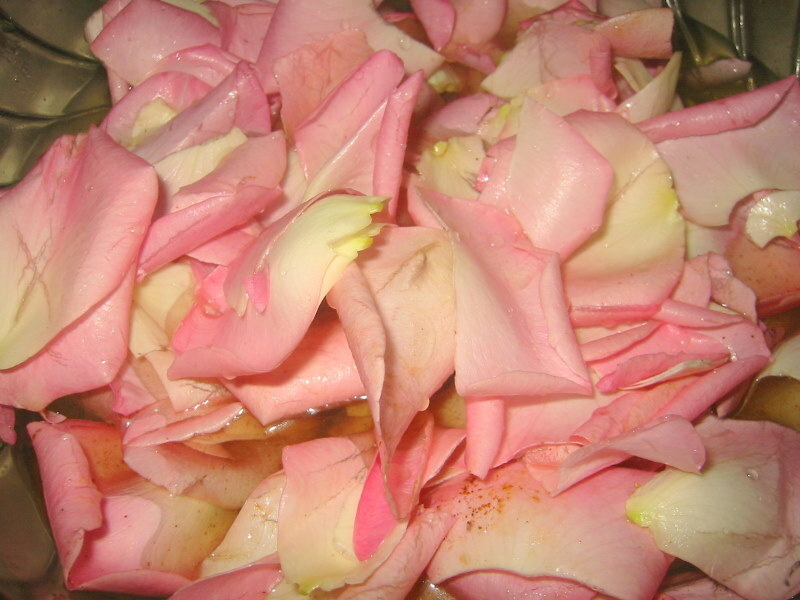 Ruda can be burned to attract love and peace. 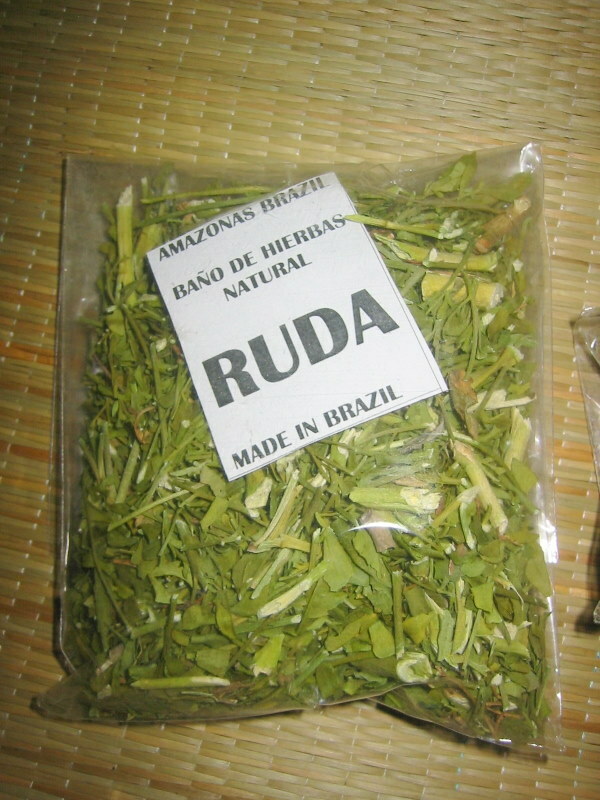 Associated with blocking all evil, negative and low vibrations ruda is an ideal herb to burn to help purify any area. You can check out my post on ruda for a more detailed description. Sandalwood has become my favorite and my go to incense recently. I find that I reach for sandalwood most often especially right before meditating. Sandalwood is used for spiritual elevation as well as a very effective calming and soothing scent. I like to use this incense with others like frank and myrrh. 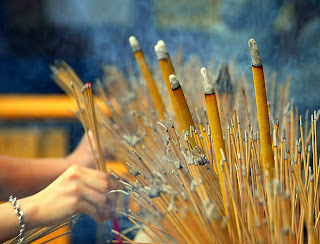 It’s a very nice incense to burn for peace of mind ald also promotes luck and prosperity. Frankincense is very ancient and associated with spiritual enlightenment. A very potent protective incense helping rid your space of negativity and low vibrations. 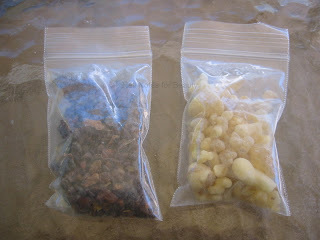 Frankincense also draws love into your home. Not just love from others but brings out the love from within one self. You really can’t mention frank without Myrrh. Like Frank, Myrrh posses amazing healing and protective qualities. When paired you have yourself a great incense to burn. I used frank and myrrh during the holidays, when I had all sorts of people, moods and energy roaming about. Myrrh promotes love and peace as well. 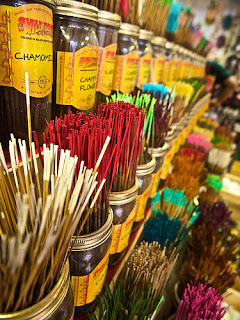 When it comes to incense the possibilities are endless. Familiarizing yourself with each scent is key since you learn how to pick up each herb’s different vibration. 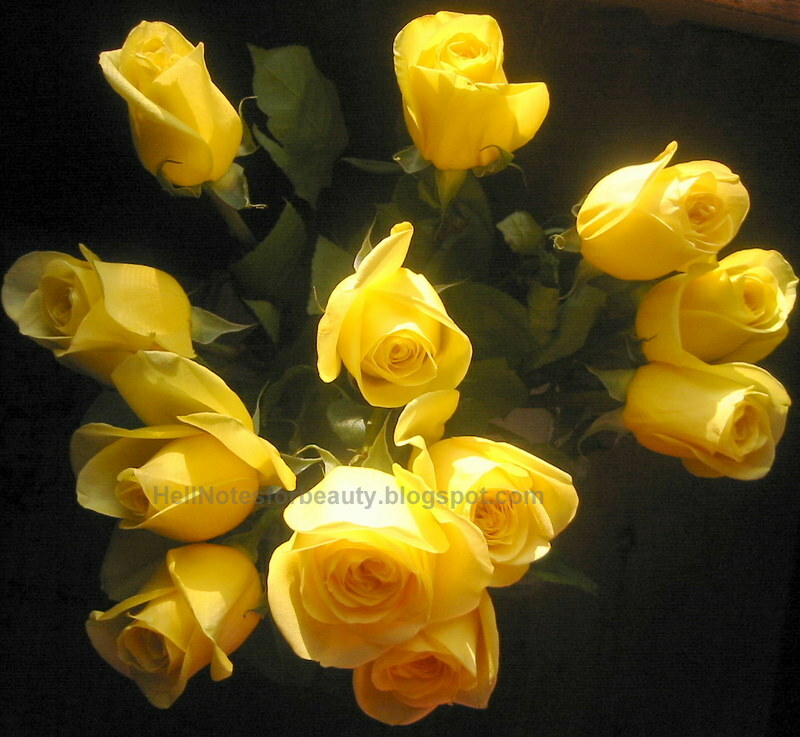 I find that I can tolerate softer scents like sandalwood and ruda. I find that sage, frank and myrrh are rather strong in terms of how I feel and sense each. I intended for this post to be a two part series but since I did not want to cram everything into one post I decided to add a third part. Next post will basically cover the basic tools you will need and mention a few basic safety precautions before you get started. Since a teenager I’ve always been a huge fan of incense, be it coconut, vanilla and scents dedicated to deities, it was my all time favorite hobby and collecting them would always turn into an adventure. 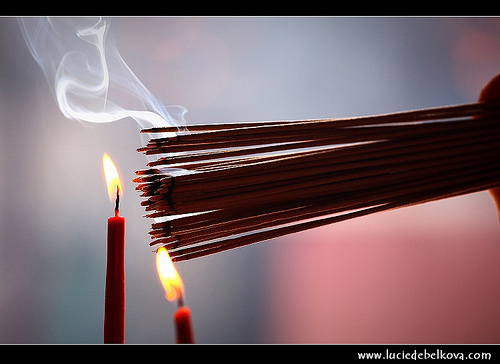 Burning incense is a very ancient practice spanning thousands of years, cultures and uses. The varied uses for incense encompasses many different religions and spiritual practices as well. It is said that the three wise men who visited Jesus lavished him with splendid gifts which actually included Frankincense and Myrrh. Native Americans most commonly used sage and a variety of herbs to perform ceremonies, prayers and cleansings as well as the Egyptians and ancient Romans. In India it’s closely linked with Ayurveda medicine, while in Japan, making incense is a form of art taken very seriously. It wasn’t until this past summer however, that I revisited my passion for incense. 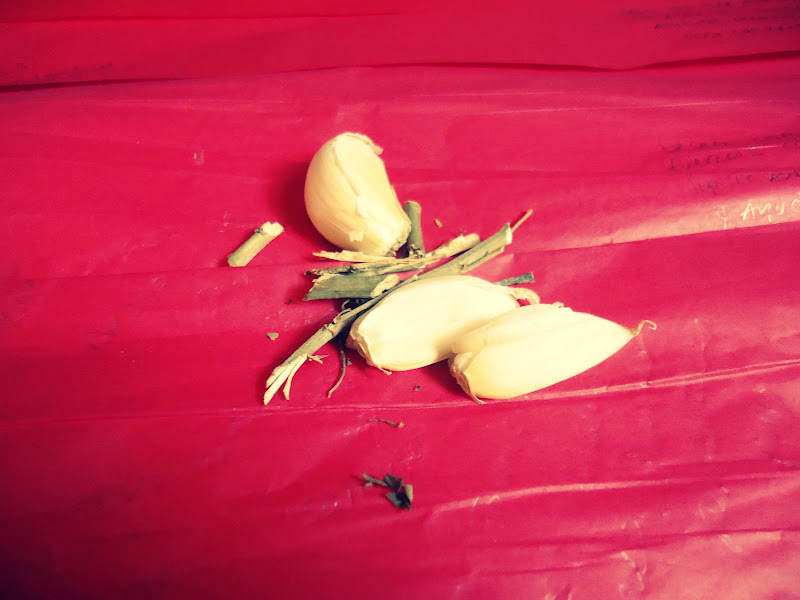 While purchasing some goodies from my local African street vendor (mostly Shea butter) I noticed a stack of what seemed like pebbles in clear bags lying next to the usual stick incenses. 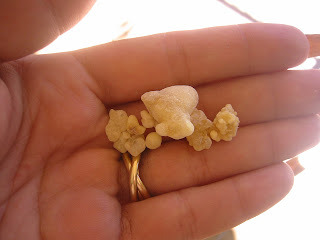 What I thought to be decorative pebbles were in fact loose frankincense and myrrh resins. I had never tried this type of loose incense before and my curiosity made me buy a pack of each. I became even more intrigued when he mentioned that I needed charcoal which left me a bit confused. He nicely informed me that I would not be able to light it unless I had charcoal. So along with the incense resins of frank and myrrh I bought, I also got a pack of charcoal. So like me you may be wondering why the charcoal and how do you use it? 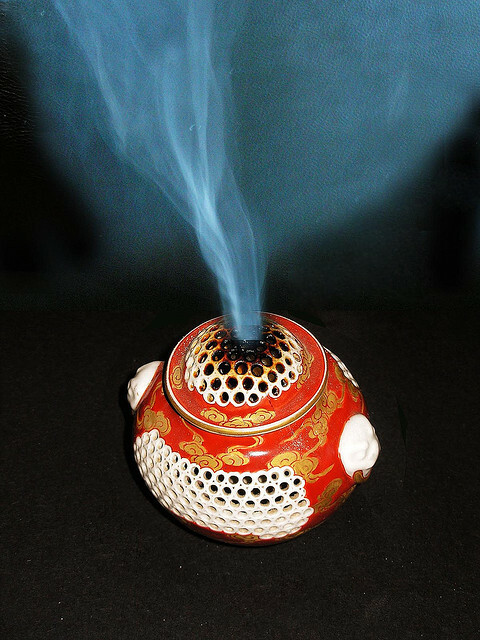 Combustible incenses are most commonly used. 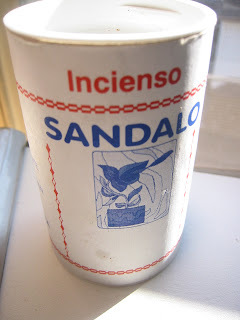 This type of incense is popular because it can be instantly lit and comes in a variety of shapes and sizes. Examples include incense sticks, cones and swirls. 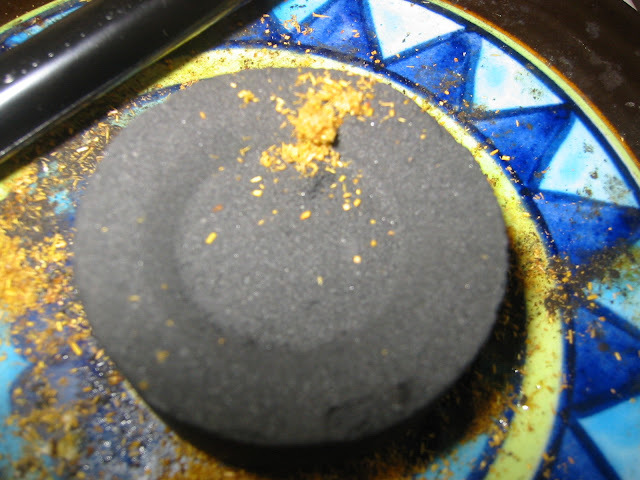 Non Combustible incense requires a hot charcoal block (like the one shown above) in which you sprinkle the loose incense into. 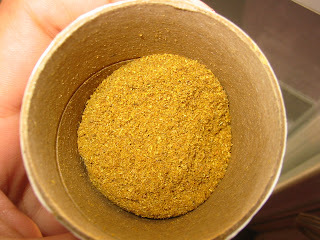 For example herbs, resins, spices etc. The charcoal helps maintain a significant amount of heat which in turn burns whatever incense you choose. 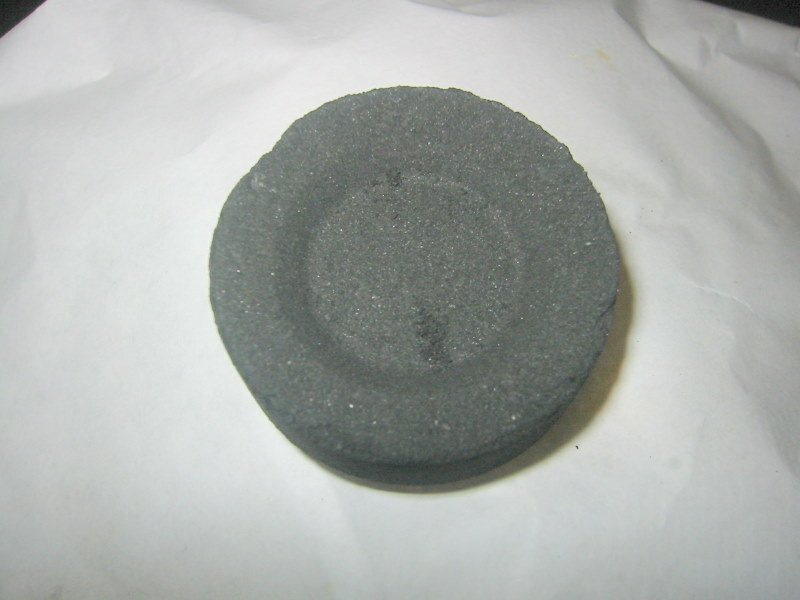 Typically these charcoal blocks have a round groove where it holds the incense in place. What helps ignite the charcoal block is the saltpeter (potassium nitrate) most charcoal blocks (and incense sticks) are made with. 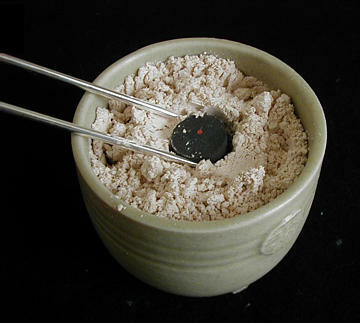 When fully lit, the saltpeter will sparkle and ignite throughout the block, glowing red indicating it’s ready to burn whatever incense you choose. The difference between the two is the amount of smoke each type emits. Incense sticks, cones etc tend to let out a more controlled smoke, ideal for meditation, clearing of a small space or to simply enjoy the aroma. 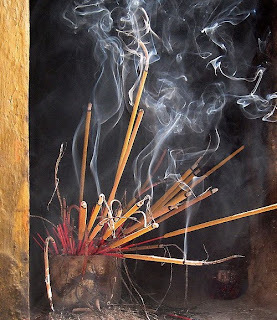 Loose incense with charcoal on the other hand, tends to billow out a lot of smoke and it’s mostly used for spiritual cleansing of spaces and environments sort of like smudging. The idea of using smoke and the aroma derived from the many herbs available, to clear and purify places, people and things is perhaps as ancient as fire itself. Everyday we tend to be unfortunately, exposed to more negativity than not. This is why it’s important to leave those vibrations (and people) at the door and try to maintain a more positive, productive and fruitful environment. Negativity rears it’s ugly head in all forms. Be it the argumentative household, envious neighbor always in your house, stressful day at work, trouble sleeping and the many more things that do not really describe a peaceful environment are just some examples of negative, stagnant energy that seems to take up permanent residence in your household and surroundings. You can yourself with incense clear your environment of any undesirable elements with simply focusing your intent on a more peaceful ambiance along with a few simple ingredients and must have tools. This will be a two part series focusing on incense and how you can use it for a variety of things. 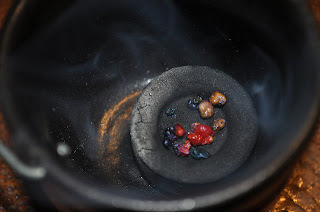 In my next post I will show you how I use incense to clear my home, the essential tools you will need before you start, as well as some incense recipes I have been experimenting with. So stayed tuned for part 2.